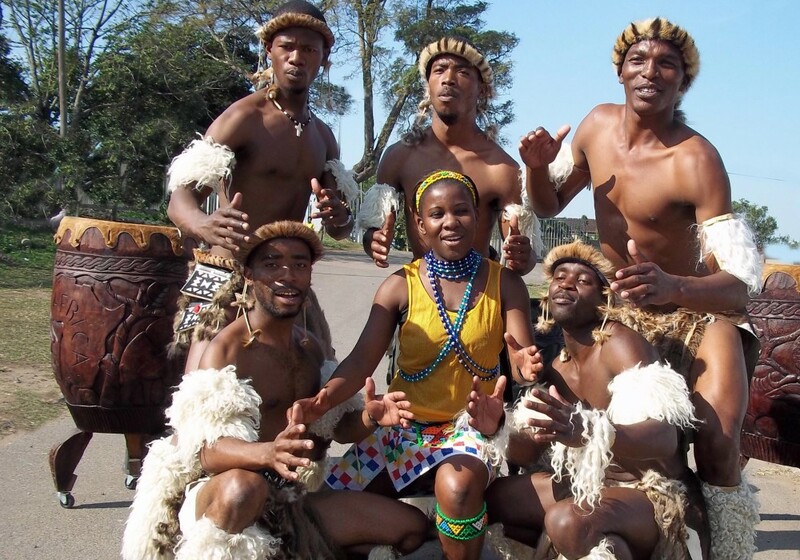 Zulu singers and dancers for hire. They deliver a heady mix of traditional South African harmonies and high-energy, athletic dance - all traditionally costumed - and supported by drum-rhythms. Imagine a youthful, mixed gender, Ladysmith Black Mambazo with high-energy dance. This is a company of genuine young Zulu singers and dancers who deliver a heady mix of traditional South African harmonies and high-energy, athletic dance – all traditionally costumed – and supported by drum-rhythms. Their stage shows are exciting, enthralling and hugely entertaining and they attract enthusiastic audiences. From prestigious events at the British Museum and the South African High Commission to community events at your local school, this new and vibrant company of Zulus reaches back into the past to preserve ancient skills while stretching forwards to contemporary Africa. 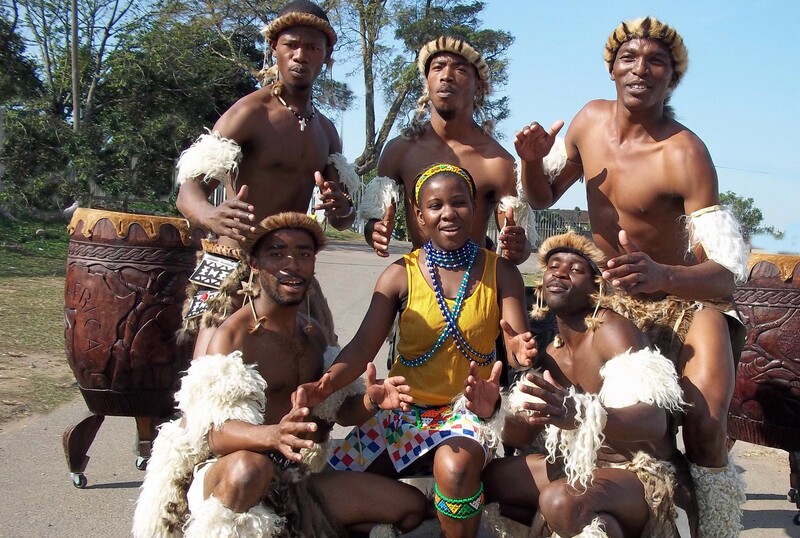 Direct from Durban in KwaZulu Natal, individual members of the group have performed in the UK and abroad, including special events for the Queen and for Nelson Mandela. They are not only great concert performers, but also excellent communicators who can deliver outdoor performances for special events, festivals, summer-seasons, galas and weddings. They also offer a range of educational workshops for young people of all ages and abilities. This is also an educational company grounded firmly in the curriculum of Africa’s rich history and the established paradigms of Zulu philosophy. It’s a ‘fairtrade’ company run by Zulus for Zulus. Learning from the Zulus’ own turbulent history, the group now brings a message of peace to the world. The excellent, professional cast delivers this through drama, song and dance in quality performances which will be remembered for excitement, entertainment, spectacle and fun. This is a young, multi-talented and versatile company. They present a powerful main-stage show combining song and dance with drums. They are also happy to do outdoor (unamplified) song and dance performances (street or ‘field’ entertainment) and workshops for young people and adults. They are easy to work with and all of them speak English. They’ll work with adults, children or family groups, outdoors or indoors. They aren’t stingy with their time, often taking extra time after a show for photographs and to talk to people individually (and even do impromptu teaching sessions if someone asks a relevant question). Festivals get great value out of this amazing act on so many levels. Whatever your festival there will be many opportunities for audience interaction. The group gathers admirers from across all age ranges with their rhythmic percussion, vibrant dance and soul-stirring harmony singing. These can all be adapted for festivals, schools or corporate days fostering team spirit. The group are experienced educators with a diverse programme of educational workshops that encourage diversity awareness; the breaking down of barriers surrounding prejudice; ethnic, religious and racial equality; community building; international understanding leading to local benefits. – Hilary Williams, The British Museum, London.